For some pups, service work is too good to be true. Enter Ryker, a German Shepard who thinks service training is as thrilling as Christmas morning. 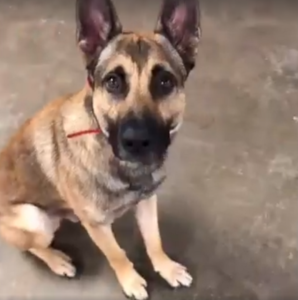 A viral video from the Double H Canine Training Academy in Louisville, Kentucky, shows the enthusiastic dog failing his training test in a hilarious way. Set to the soundtrack of Frank Sinatra’s classic, My Way, Ryker shows how he has taken to service training his way. 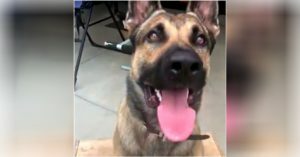 Before we get to the good stuff (the hilarious video), let’s talk about the impressive power of a service animal. 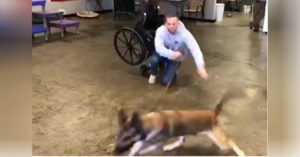 The Americans with Disabilities Act (ADA) defines these type of pups as, “dogs that are individually trained to do work or perform tasks for people with disabilities.” These dogs go through extensive training to learn their responsibilities. Service dogs perform all sorts of tasks to help people in need. For example, guide dogs help individuals with hearing or visual impairments. Other dogs assist people in wheelchairs or people who have autism. Some of these pups offer seizure alerts and can notify those who need to be alerted to low blood sugar, or have psychiatric disabilities. The dogs are trained to retrieve items, open doors, and push buttons. They must learn an impressive amount of tasks. As if we needed more reasons to call dogs man’s best friend! However, to become a service dog, the pup must go through some intensive work. Even after his training, our friend Ryker was a little too excited to pass the test. But…have you seen this gorgeous pooch? It’s hard not to be proud of a dog who shows this much exuberance. Ryker’s Not Alone – Check Out This Major Dog Fail Video! The video begins with Ryker trying to move an empty wheelchair around. Instead of pushing the wheelchair in a straight line, the excited pup chews on the device and it falls over. Whoops! In the next part of the video, a man uses a walker with tennis balls on the legs. The tennis balls are there to keep the walker from sinking into dirt or getting caught on carpet or area rugs. Can you guess why Ryker thought the tennis balls were on the walker? To play with, of course. Ryker went straight to the tennis balls because he thought they were there to entertain him. Can you imagine what would happen if the person truly needed the support of the walker? Yikes. One of the funniest parts of the video are the dogs watching this scene play out. They sit in the background and you can almost see their judgy eyes. In the next part of the video, Ryker is supposed to help a man using a wheelchair. Our buddy Ryker is instantly distracted when a ball is thrown. His companion is quickly forgotten when a ball flies past his field of vision. In fact, the man in the wheelchair is dragged to the floor when Ryker zips past. As the video progresses we’re treated to more of Ryker’s delightful antics. When commanded to retrieve a water bottle, Ryker uses a bit too much pressure and spills water all over the floor. He does get one task right. It’s Ryker’s job to open a refrigerator. He does so wonderfully…until he yanks the entire fridge away from the wall. The boy has got strength! There’s even a slow-motion portion of the two-minute video that shows Ryker playing with a ball in all his glory. It’s pretty magical stuff. Don’t take our word for it. Pause your busy day and get ready to laugh. Watch the full, hysterical video here. Not every dog can meet the rigorous requirements of a service animal. That doesn’t make Ryker any less loveable or fun to be around. We love watching his hilarious display of enthusiasm. This short video makes us appreciate how much hard work humans and canines alike put into becoming service animals. If you’re curious about trainers local to you, look at this list of US service training centers.